It’s not surprising to learn that a company the size of Toyota has non-automotive interests, among them biotechnology, chemicals, agriculture, marine, environment, energy and other high-tech fields. But even to fans, the brand’s homebuilding division is obscure, especially outside Japan. Yet for 40 years, Toyota Home has built modular, steel-framed houses. And we mean modular. The division goes back to Toyota founder Kiichiro Toyoda himself, who watched Tokyo burn in the Allied firebombing of March 9, 1945. Thirty years later, Japanese homes were still almost exclusively wood-framed, even in cities, making them vulnerable to fire and earthquake. Kiichiro hoped his steel-framed, prefabricated houses would make affordable, durable and safe housing more widely available. Progress was slow; 12 homes were sold through 24 car dealerships in 1976, their first full year of production, and cracked the 1,000 mark in 1987. Sales plateaued around 5,000 in 2006, dipping sharply during the recession, but their technology hasn’t slowed at all. Each house is built from six or more steel-framed cuboids, completely wired and plumbed at the the factory. They’re assembled on-site on a concrete pad, stacked and bolted together. Japanese vloggers Rachel & Jun Yoshizuki recently filmed a small unit being put together—which it seems you can’t just walk up and do. (Toyota also doesn’t allow filming in its factories). The first module of the 4 x 4 unit lands on the pad at 9 AM, and by 3 PM it’s done, including balconies and roof. To the eyes of someone who worked in American construction, it’s slightly horrifying, as workers are constantly below suspended loads and there’s an incredibly high lift over what I presume are active power lines. The quality of the completed structure is obvious, and it comes with a 60-year warranty. If it were our money, we’d take the enthusiast Espacio Garage Style +. 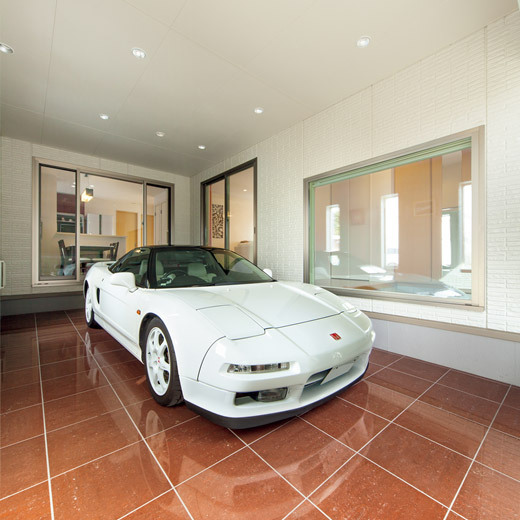 Most Toyota Home customers are Toyota car owners, but the Garage Style + advertising shows a white Honda [Acura] NSX parked on a red tile floor outside the dining room. It sounds like home to us.